Over/Under: Over 174.5 at 1.90 Bet Now! Both of these teams have a 2-1 record and are the joint leaders in Group G in the EuroCup at this stage of the season. With both of these teams meeting last week, it is a fast turnaround from the first ever clash between these sides and Zenit come in great spirits having triumphed by a score of 101-81. Ryan Toolson was the key player in that game offering 28 points while Amare Stoudemire was also impressive, providing 22 points in the loss. Both sides know that a win will take them a long way to securing a spot in the quarter-finals of the EuroCup, so they should be looking to make the most of this opportunity. Curtis Jerrells has been a key player for Hapoel, providing an average of 17.4 points per game while Jerome Dyson has also been important, providing an average of 12.1 points game. Stoudemire will want to have another big game like last week as he managed an average of 11.1 points per game and an average of 5.7 rebounds per game so far this season. Toolson has been in good form this tournament, offering an average of 21.8 points per game while Janis Timma has notched an average of 17.3 points per game while also offering an average of 4.8 rebounds per game. Zenit can also boast of the leading assists player in the tournament as Stefan Markovic has provided an average of 9.1 assists per game and 12.2 points per game. 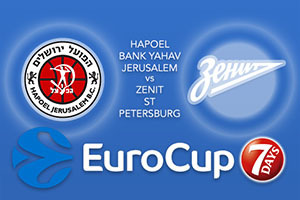 Hapoel need to be stronger in defence this week as Zenit managed to grab at least 22 points in each quarter, which is going to hurt any team. Zenit have a great scoring record this season, offering an average of 90.5 points per game, and this could be a key factor of this game. The bookies are struggling to split these teams so take Zenit St Petersburg at -1.5 which you can find at odds of 1.90. When it comes to the Over/Under market, look to go OVER 174.5 at odds of 1.90. Bet Now!